Drive best test practices by integrating essential functions together with the MPOLx and help technicians finish jobs faster by optimizing their workflow. The MPOLx gives technicians the ability to achieve a completely new level of productivity for MPO testing and certification. 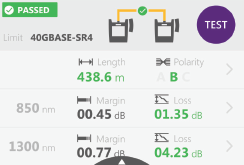 Like all our solutions for Tier 1 (Basic) fiber certification, identical local and remote units are provided to enable full visibility and control by performing tests from both the Light Source and Power Meter. All devices feature a 3.5” color touch screen and integrated inspection for both bulkhead and trunk connectors. The MPOLx allows a single technician to inspect MPO end faces and perform tests from either end of the connection, reducing walking back and forth between the two units. 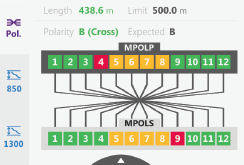 The MPOLx ensures fast workflows by delivering comprehensive test results in less than 6 seconds for all 12 fibers of the MPO connector providing color coded pass/fail test results, test limit, fiber length, test wavelengths, loss values, margins, and polarity results for each MPO fiber.